Theo Jansen (b. The Hague, Netherlands, 1948) dreams up creatures capable of moving along Dutch beaches, where they evolve and later perish. 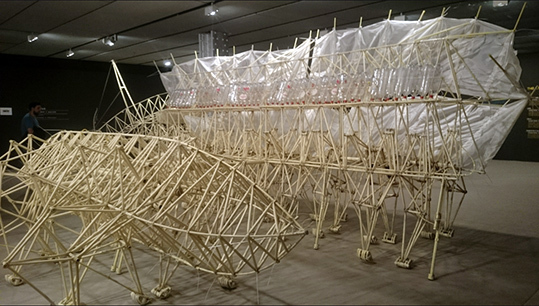 They are the mighty Strandbeest (Beach Animals). Some of these living and fossilised beasts, including Ordis, Currens Vaporis, Currens Ventosa, Rhinoceros Tabulae and Percipiere Primus take over Espacio Fundación Telefónica, Madrid from 23 October 2015 - 17 January 2016. Theo Jansen: Amazing Creatures, Installation view, Espacio Fundación Telefónica, Madrid, 2015-2016. Theo Jansen: Amazing Creatures from ArtworldNow on Vimeo.